How Does a Convertible Top Work? What is a convertible top? 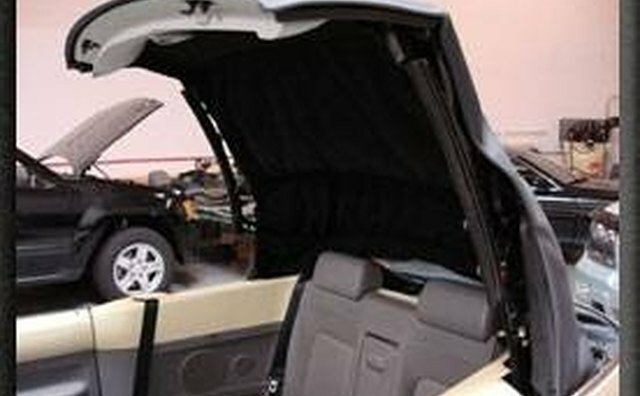 Convertible tops are a type of vehicle top that folds, or retracts. They are usually soft, but recently, some vehicles have been manufactured with hard tops that fold down and can be concealed. However, these hard tops are not known as convertibles. Instead, they are called retractable hardtops because their frames are usually made out of steel. 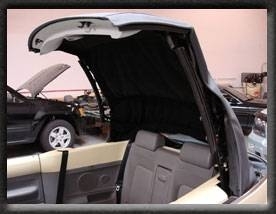 A convertible top is usually made from canvas or vinyl and fits over a steel, rigid plastic or aluminum frame. When convertible cars were first manufactured, they initially were made with only two doors. This holds true today. The production of convertibles spiked between the 1950s and 1970s and used to be available with only a plastic rear window. These days, tops are more durable, and a heated glass window has replaced the plastic window in many convertible models. However, quite a few convertibles still do come with the plastic rear window. The folding design of the convertible top's frame can vary and can be elaborate. Some vehicles come with electric convertible tops, while other come equipped with manual convertible tops. The electric tops have a retraction mechanism that is designed to unfold and fold the frame, which is often referred to as the power top. The driver simply has to push a button, and the top retracts or goes up. Manual tops require that the driver unfasten the top's latches from the windshield before he can manually push the top down. In order to put the top up, he would have to pull it up manually and reattach the latches to the windshield. One of the major problems that electric convertible tops have is failure issues. The electric motor that controls that top can sometimes fail and result in either the top not going up or the top not being able to go down. Also, convertible tops are prone to tearing. They need to be conditioned on a regular basis in order to prevent damage. In addition, the top should be hand-washed with soap and warm water. There is a special vinyl cleaner available that will clean the top as well. You can also use Scotch Guard to protect the top and soften it by using a liquid fabric softener. Never try to spot clean a top because it can leave rings or spots. Never use abrasive cleaners or cloths on the top, as they can damage it. Also, if you retract the top while it is wet, make sure that you raise it to avoid mold from growing on it. What Does Body Style of a Vehicle Mean?